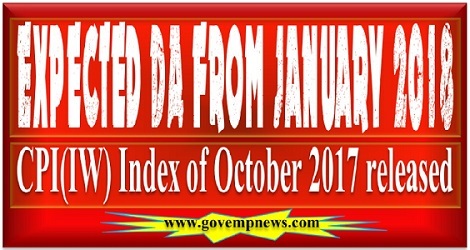 All India Consumer Price(Industrial Workers) Index Number [CPI(IW)] of Oct, 2017 has been released yesterday by Labour Bureau and increased by 2 points and pegged at 287 (two hundred and eighty seven). With this increase 7th CPC Dearness Allowance/Dearness Relief for Central Govt Employees and Pensioner w.e.f. the month from January, 2018 will be 7% with 2% increase in July, 2017 DA/DR. On the other hand the 6th CPC DA speculated to be 143% with 4% increase in present DA Rate. The speculation of month of Sept, 2017 while 5 points increase in All India Consumer Price(Industrial Workers) Index Number [CPI(IW)] of July, 2017 was indicating 7% 7th CPC Dearness Allowance with 2% increase & 142% 6th CPC DA with 3% increase in 6th CPC Dearness Allowance from January, 2018 has comes true after 3 months.